Today’s post was written by Bryan Goode, general manager for Office 365. Today at Microsoft Ignite, we unveiled a new vision for empowering Firstline Workers in the digital age and introduced Microsoft 365 F1—a new offering that brings together Office 365, Windows 10, and Enterprise Mobility + Security to deliver a complete, intelligent solution to empower all workers. The modern workplace requires companies to meet new employee expectations, connect a more distributed workforce, and provide the tools that allow all employees to create, innovate, and work together to solve customer and business problems. A truly modern workplace brings out the best in employee ingenuity, creates a culture of innovation and action, and welcomes and empowers all workers from the executive team to the Firstline Workforce. Firstline Workers comprise the majority of our global workforce. Numbering two billion people worldwide, they are the people behind the counter, on the phone, in the clinics, on the shop floor, and in the field. They are often the first to engage customers, the first to represent a company’s brand, and the first to see products and services in action. They form the backbone of many of the world’s largest industries, and without them, the ambitions of many organizations could not be brought to life. We see an opportunity for technology to give Firstline Workers a more intuitive, immersive, and empowering experience. Microsoft is in a unique position to help companies tap into the potential of their Firstline Workforce with our commercial product offerings, spanning Microsoft 365, Dynamics 365, Microsoft IoT, Microsoft AI, and Microsoft HoloLens and the Windows Mixed Reality ecosystem. The introduction of Microsoft 365 F1 represents a significant next step towards our vision of involving the Firstline Workforce in digital transformation by empowering every worker with technology. Microsoft 365 F1 includes the capabilities and tools to enable every worker to turn their ideas into action. It fosters culture and community, with Skype Meeting Broadcast for interactive townhall meetings and Yammer to help employees find and share best practices across the company. Microsoft 365 F1 makes it easy to train and upskill employees, with Microsoft Stream to share dynamic, role-based content and video, and SharePoint to easily distribute onboarding and training materials and manage institutional knowledge in one secure place. It supports firstline productivity and digitizes business processes, with Microsoft StaffHub, a purpose-built app for Firstline Workers to manage their workday and Microsoft PowerApps and Flow to automate everyday activities. Today, we’re announcing new capabilities coming to StaffHub, including the ability for employees to clock in/out and track tasks. We are also making it easier for employees to stay connected in StaffHub, by integrating messaging with Microsoft Teams, the hub for teamwork, and highlighting corporate announcements made in Yammer. Finally, we’re enabling customers to connect StaffHub to workforce management systems and other tools with the availability of general APIs. 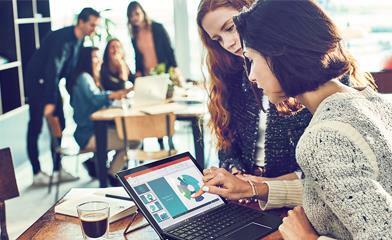 Microsoft 365 F1 streamlines IT management, minimizes cost, and extends security to all employees and endpoints. Azure Active Directory provides management of employee identity and access; Microsoft Intune helps secure devices; and new features in Windows 10 simplify the management of Firstline Workers’ experiences, supporting locked down single purpose devices with Windows Assigned Access and automated deployment with Windows AutoPilot. Finally, we recognize the importance of providing Firstline Workers streamlined and secure devices that minimize total cost of ownership. Today, we’re announcing new commercial devices with Windows 10 S from our OEM partners HP, Lenovo, and Acer. Starting as low as $275, these devices benefit from cloud-based identity and management and are ideal for firstline environments. We are incredibly excited about our opportunity to empower Firstline Workers and we are just getting started! 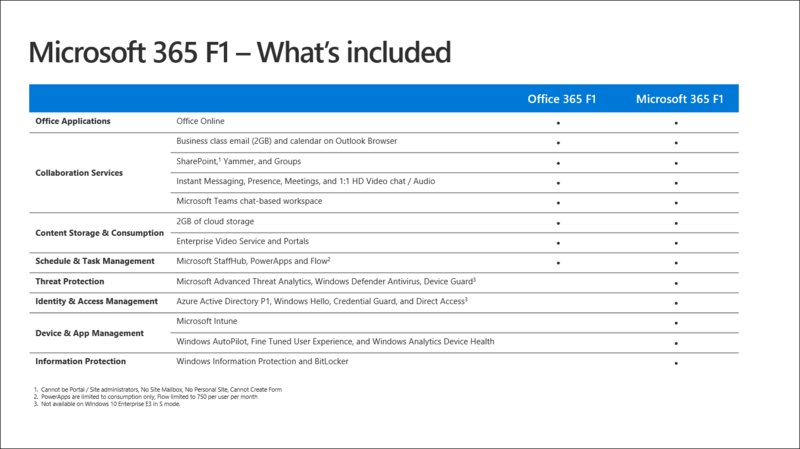 To learn more about our vision, please visit our new Firstline Worker page and see the table below to learn what’s included in Microsoft 365 F1.